Professional House Cleaning Tips: Do you know what Empire interior style is? Do you know what Empire interior style is? In the grand abundance of various interior styles, you have the exclusive possibility to choose something that will suit to both – your personal preferences and your house type. When you pick up the classiest and the finest design to a room or to entire domestic area, compactness and convenience are significant, but not the only factors that form your choice. The impression you would like to achieve and the charm are also leading and important. 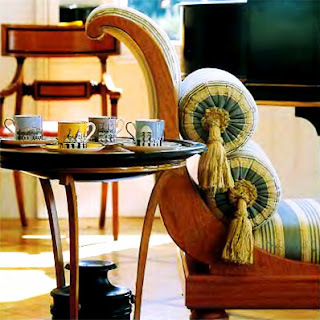 Classical and contemporary interior styles today are minimalism, Baroque, Antique, modernism and classicism. But do you know what Empire interior style is? - Origin – established in the end of the 18th century, the lovely Empire style collaborates with two different cultures. The brilliant Ancient Roman trends of opulence are presented in a modernized French appearance. Both styles suppress on splendour and luxury and today they are also accented with expensive old relics, antique items and much of shininess! - Similarity to Neoclassicism – both interior styles today are depicted with the idea of spaciousness, glamour and imperial grandeur. However, the Empire style comes with several specific symbolical parts and they are all devoted to the greatness of the emperor – emblems, bees, military trophies, vogue decors and stunning surfaces from past, which today are equal to the Red Queen carpets. - Floors – they are usually covered with attractive bourgeois plasters. Sleek lines in golden, brown and mahogany are more preferred to large carpets. This feature of the Empire style may arrest your attention in case you really hate carpet cleaning! - Walls – as well as the floor, they are also imitating or literally displaying wooden fascination in walnut, beech, oak and different fruitwoods. Walls are also enriched with classical motives and original paintings, frames and retro decors from the Ancient epochs of the Roman history. - Furniture – heavy and painted in strong palettes to reflect the optimism in the country. The typical nuances are green, lemon yellow, azure blue and of course, royal red. Silk, muslin and merino wool are the Empire damasks you should seek for! - Main decors – crystal chandeliers, sophisticated wall sconces and curtains with heavy silk!